Control systems have come to play an important role in the performance of modern vehicles with regards to meeting goals on low emissions and low fuel consumption. To achieve these goals, modeling, simulation, and analysis have become standard tools for the development of control systems in the automotive industry. Modeling and Control of Engines and Drivelines provides an up-to-date treatment of the topic from a clear perspective of systems engineering and control systems, which are at the core of vehicle design. This book has three main goals. The first is to provide a thorough understanding of component models as building blocks. It has therefore been important to provide measurements from real processes, to explain the underlying physics, to describe the modeling considerations, and to validate the resulting models experimentally. Second, the authors show how the models are used in the current design of control and diagnosis systems. These system designs are never used in isolation, so the third goal is to provide a complete setting for system integration and evaluation, including complete vehicle models together with actual requirements and driving cycle analysis. 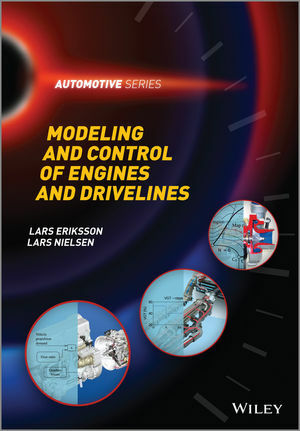 Modeling and Control of Engines and Drivelines is a comprehensive reference for graduate students and the authors’ close collaboration with the automotive industry ensures that the knowledge and skills that practicing engineers need when analysing and developing new powertrain systems are also covered. Lars Eriksson is an Associate Professor of Vehicular Systems at Linköping University with main responsibility for the engine control laboratory. Since 1994, he has been working as a researcher in the field of modeling and control of engines and drivelines with research that is performed in close collaboration with industry. This provides good contact with practicing engineers and who are then able to offer their input when new research results are integrated into course curriculums. As a teacher he has developed and taught several courses on this subject, both at the university and for industry. At Linköping University he is responsible for the course “Modeling and Control of Engines and Drivelines” which has been given on the subject since 1998 and he is also a regular lecturer for the module “Basics of SI engine control” on the Powertrain Engineering Programme at IFP School in Paris. Since 1992, Lars Nielsen has been a Professor of Vehicular Systems holding the Sten Gustafsson chair at Linköping University. His main research interests are in automotive modeling, control, and diagnosis, and he has been active in all aspects of this field during its expansion and growth since the nineties. His supervision has led to thirty graduate exams, in many cases with significant industrial participation. The collaboration aspect has also been strong in his role as center director for two large centers of excellence (ECSEL 1996-2002, LINK-SIC 2010- ). In the international research community, he was the Chairman of Automotive Control within the International Federation of Automatic Control (2002-2005), and then the Chairman of all Transportation and Vehicle Systems (2005-2011). Selected national commissions of trust are Board Member of the Swedish Research Council-NT (2001-2006), and vice chair in IVA II - the electrical engineering division of the Royal Swedish Academy of Engineering (2010-).